Watch this Powerful Spoken Word On How It Feels "To Be Black and Woman and Alive"
Home beauty standards black beauty black men cultural appropriation performances spoken word poetry Watch this Powerful Spoken Word On How It Feels "To Be Black and Woman and Alive"
"To be woman and to be black is to born knowing your beauty does not belong to you," Crystal Valentine says in this spoken word performance with Aaliyah Jihad titled "To Be Black and Woman and Alive", centered on dismantling the type of cultural beauty appropriation that has black men devaluing black traits on black women while praising them on others. 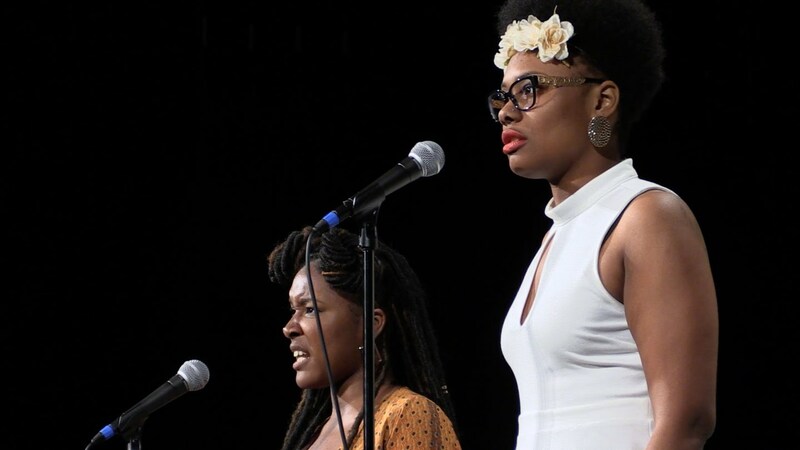 Valentine and Jihad delivered a moving, raw performance during the 2015 College Unions Slam Poetry Invitational. "I grew up learning how to protect men who hate me," Jihad says to loud audience applause. "To be woman and black is to be magic," they later affirm. "Is to be the witch that wouldn't burn. To survive the white men with their needles and nooses, and the black men with their hearts and knuckles. To be black and woman and alive is to be resilient." Watch the performance from Button Poetry below.